Covering a most brutal fratricidal war for a decade, I had never imagined returning to a serendipitous Sri Lanka as a tourist without fear. This series, which I began in 2013, should have begun with a thank-you note to Shoojit Sircar, one of our new breed of young and thinking filmmakers. His landmark Madras Café marked a new beginning in Hindi cinema. Unlike Bhaag Milkha Bhaag, it did not claim to be a biopic. And, unlike Milkha, it stayed much closer to the real story which, again entirely unlike Milkha Singh’s, is one of the saddest in our history: the LTTE-led terror, war with the Indian Peace Keeping Force (IPKF) in northern and eastern Sri Lanka, and the assassination of Rajiv Gandhi. Of course, there was much fictionalisation, some for the convenience of storytelling and some for political caution. But there was enough for somebody who saw these events up close to go back to the story, and then tie up some ends with current research to retell it. That is why Shoojit gave me that nudge to start putting together a reporter’s memoir of sorts. Publishers have often approached me to write one, and I have routinely fobbed them off with a permanent, lazy journalist’s excuse: editors write books between jobs. Inspired by Madras Café, I tried an unconventional approach to that memoir in the form of this series, where I will try and revisit, say, some 20 of the biggest stories of our times that I was witness to. And don’t get alarmed. I won’t be inflicting this on you in a never-ending serial, but only occasionally. “First Person” in this series comes from the idea that I confine myself to my first-hand experience. And “Second Draft”, because the passage of time gives you the benefit of reflection and hindsight to see what you covered in real time in fresh light. These stories were done in different periods in years spread over The Indian Express and India Today and I am grateful to the latter for allowing me the use of archival material, including pictures and some graphics. I was assigned to follow up on Rajiv Gandhi’s assassination within about 10 days, as the first indications of a Sri Lankan connection emerged. I was already an old Sri Lanka hand, having been both lionised and demonised in that country. But more about that later. I landed in Colombo in the first week of June, 1991. The first person I called was Lalith Athulathmudali, former defence and internal security minister, once a rising star in Sri Lankan politics, and one of the most brilliant and articulate politicians I have ever met in the subcontinent. By now, however, he was much diminished. Politically, he was marginalised in opposition to President Ranasinghe Premadasa. And physically, he was a wreck. A bomb aimed at President Jayawardene in the Sri Lankan parliament in 1987 had landed in Lalith’s lap instead. He was a medical marvel, living with hundreds of pieces of shrapnel in his body. To describe the Lalith I met in 1991 as a pale shadow of the man I knew from 1985 will be a phenomenal understatement. Politically, physically and even personally, he had no resemblance to the man then seen as Sri Lanka’s P. Chidambaram (then a rising star in Rajiv’s government, although nine years younger), and not only because they were both Harvard graduates and handling sensitive internal security portfolios in their respective countries. They were both brilliant, articulate but measured to the extent of sounding cold by the subcontinent’s garrulous standards. Lalith was also Benazir Bhutto’s friend, and preceded her as president of the Oxford Union. But this afternoon, there was desolate quiet in his home. There was no offer of a full evening with a meal and cognac. I graphically remember, on the other hand, the surreal presence of a valet in a red muslin sari-like wraparound, a white blouse and petticoat, a few strands of beard — evidently a transvestite — serving us tea. Something was very, very odd with proud old Lalith, the ladies’ man. “So you’ve come to find out who killed Rajiv? I will tell you,” he said, “the same gang that tried to kill me and failed, but will succeed eventually,” he said. “Which gang, Lalith, let’s be specific”, I asked. “It is the LTTE, of course,” he said, “but it isn’t just the LTTE. This b…… is also hand in glove with them,” he said. He was referring to his president, Premadasa. “You have really got shaken up, Lalith,” I said. “How can you make such a serious allegation?” I was quite sure that he had gone completely unhinged. “You know nothing, my friend,” he said. “This b……d killed Vijaya Kumaratunga (Chandrika’s matinee idol husband and peace activist, fondly described as the Amitabh Bachchan of Sri Lanka). This b……d killed Ranjan Wijeratne (Lalith’s successor in the national security ministry), he also got Rajiv killed. I survived once but he will finally get me killed. He will get Gamini Dissanayake (another prominent opposition leader) killed. Then, I am sure, he himself will get killed eventually. And you, my friend, do not ask too many questions here. You know too much. In fact, the sooner you go back the better,” he said. Events later proved he had not gone unhinged. He was just desperately scared and bitter, but still brilliantly, and tragically, prescient. Everything he predicted came true. In April 1993, a gunman killed Lalith. Initially, Premadasa blamed the LTTE, and produced the body of the usual suspect, a young Tamil with a cyanide capsule in his mouth. A commission later indicted Premadasa, and among others, a band of mobsters, three of whom were mysteriously but predictably killed. Just eight days later, Premadasa too was blown up by an LTTE human bomb at a May Day rally. You want to know some gory details? It was in the course of that honeymoon with Prabhakaran that the LTTE got this adolescent Tamil masseur to inveigle his way into Premadasa’s household. The president was soon obsessed with him. So much that he took him along on his travels and nobody cared to frisk him. So he came, as was usual as a soldier of the LTTE, with a bomb belt, and gave Premadasa a final hug of death. The only place where Lalith got his script a little wrong was in the timing of when Gamini, the new claimant to Jayawardene’s legacy, would be killed. He was shot and bombed at an election meeting by the LTTE, a year after Premadasa. And his other, more bizarre claim of Premadasa arming the LTTE? In a long interview with me, published in the 15 May 1995 issue of India Today (‘Prabhakaran decided in cold blood to kill Rajiv’), the new Sri Lankan president, Chandrika Bandaranaike Kumaratunga, confirmed that fact unequivocally. Even as a wreck, Lalith had been right on everything he said, beginning with his assertion that the LTTE had killed Rajiv. Of course, nobody has as yet found out if there was a Premadasa connection. The IPKF had been the first to pick up that bizarre nexus between Prabhakaran and Premadasa. Lt Gen. Amar Kalkat, the IPKF commander who finally turned the tide in Sri Lanka, had Prabhakaran cornered in his Kilinochchi jungle dugout. I remember exchanging notes with furious IPKF officers then who always suspected that RAW was playing a double game, that it did not want Prabhakaran killed as he was India’s leverage with Colombo. The Army suspected that RAW tipped Prabhakaran off more than once as they closed in. In mid-1989, I, along with photographer Shyam Tekwani, travelled through Jaffna, Trincomalee and Batticaloa and spent time with Kalkat (who generously had us flown in his Mi-17 to all his three division headquarters, 54th, 57th and 36th) and this conspiracy theory was the common ops room and mess whisper. There was also talk of the LTTE’s sudden new firepower and even a bitter, diabolical suspicion sometimes that RAW was behind it. But soon, it became evident that an incredible new alliance between Prabhakaran and Premadasa had come into being against a common enemy, the IPKF. Posters appeared overnight in central Colombo, describing the IPKF as Innocent People Killing Force. And with M. Karunanidhi’s DMK a member of V.P. Singh’s new coalition in Delhi, the IPKF’s mission was now well and truly over, and Prabhakaran had lived to fight and kill another day. In this case, he took revenge on Rajiv for sending the IPKF, and probably “rewarded” Premadasa for being such a loyal ally. In that endless story of deceit, Shoojit’s film got another sequence right, though the timing is advanced by three-and-a-half years. It is the “RAW-inspired” but failed rebellion of the LTTE number two “Mallaya”, who is then betrayed by a compromised RAW officer and executed by Prabhakaran. This is a real life story. But the man in reality was Mahattaya, a nickname or nom de guerre for Gopalaswamy Mahendrarajah, effectively the LTTE’s number two. He played along with both RAW and Premadasa, and most likely the latter betrayed him, leaking details of his secret meetings with a senior RAW functionary “Chandra” (Chandrasekharan). 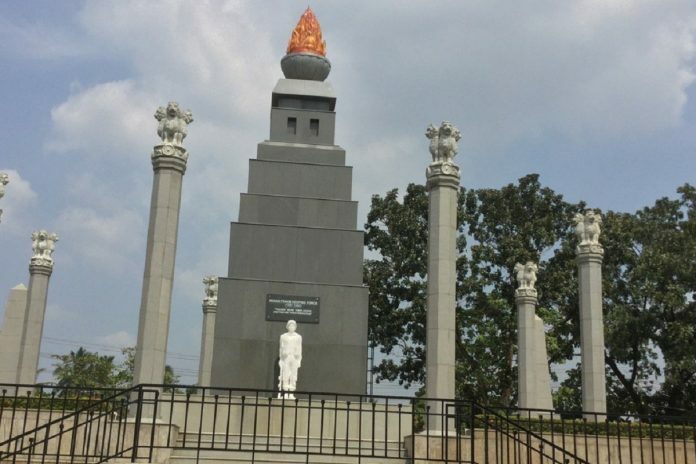 Mahattaya was executed along with his 257 loyal soldiers by one firing squad near Chavakachcheri in Jaffna. But this happened on 28 December 1994 and not before Rajiv’s assassination in May 1991, as the film claimed. The other thing the film got right, but mixed up the time frame, was the betrayal by the RAW station chief in Chennai. K.V. Unnikrishnan, a 1962 batch IPS officer, had been caught by IB counter-intelligence in 1987, “compromised” to the CIA. He had apparently done India’s cause real damage but had nothing to do with Rajiv’s assassination much later. One of his daughters was a talented shooter and, apparently, the CIA handler cultivated him by routinely gifting him boxes of sport ammunition, which were then imported and expensive. The next step was a honey trap, using a Pan Am stewardess, and blackmail. A story just like Madras Café’s Bala’s. Unlike Bala, who shoots himself, Unnikrishnan was in Tihar for a year and then, in one of those eternal mysteries of V.P. Singh’s short tenure, released. Fired from the IPS, he is now said to live a quiet life in Chennai. And his daughter’s talent was for real. She won several shooting medals for India and is an Arjuna awardee. Back to Lalith now. And different sorts of conversations with him through heady cognac evenings. An early 1984 story (‘An ominous presence in Tamil Nadu’, India Today, 31 March 1984) had given me notoriety in India and instant fame in Colombo. It had revealed, for the first time, the existence of Sri Lankan Tamil guerrilla training camps in India. South Block was furious. The charge of being anti-national was made by none other than Mrs Gandhi, and in public. Of course, Colombo did its best to “enhance” that charge by putting that story on thousands of pamphlets and distributing them all over the world. My central point was, we were feeding a monster and it would devour us. Therefore, when I first landed in Colombo in September 1985, for what was to be my first real foreign dateline, I was received very warmly, actually lionised. I was given the privilege of an invitation to the national security minister’s (Lalith’s) home. He was reputed to be arrogant, dismissive, an anti-Tamil and anti-India hawk. But we became such friends in the first meeting that I got a repeat invitation the next evening at his farmhouse, where he introduced me to his wife Srimani. He pointed to a framed picture of theirs with Giani Zail Singh on a visit to Rashtrapati Bhavan and spoke — vainly, as was typical of him — of how Gianiji, taking note of his wife’s fair Dutch Burgher complexion, said she looked like a Punjabi. Of course, he later wrote a formal letter to me, complaining that I used particularly unflattering pictures of his with my stories. The next day, 11 September, was a sad one for Indian cricket. I was in the press box as we lost our first Test match ever in Sri Lanka. It was such a big story the next morning that it blanked out on the front pages the anti-Tamil riots which had meanwhile broken out in Trincomalee. The strategic port and resort city was barred to the foreign press. Since that was the only real story in Sri Lanka then, I still decided to hop on to the train to Trinco. It involved some elaborate lying. I told Lalith, as well as Hardeep and Lakshmi Puri, then senior diplomats at our high commission (Hardeep is now our Union minister for urban development and Lakshmi works with UN Women in a key position) that I was going to Kandy to watch the third Test. Lalith frightened me by saying he may be coming there too and would send for me in the press room during lunch. I proceeded to Trinco nevertheless. The only name I knew there was Commodore Justin Jayasuriya, the Sri Lankan Joint Operations Commander (JOC). I had had reporters’ luck finding myself next to him on the Indian Airlines flight from Madras to Colombo. Since he was an NDA alumnus, we found some common acquaintances and he gave me his number in Trinco. He was also generous enough to grant me an audience at his headquarters as I reached his burning city. Trouble came the next morning. Taking pictures of a Tamil temple being burnt by a Sinhala mob, helped along by the armed police, I, along with a British freelancer and his girlfriend dressed in no more than a bikini with a sarong wrapped like a ridiculous fig leaf, was arrested by the same soldiers, who locked us up, threatening to shoot and throw our bodies on the street. I dropped the two names I thought might work. Lalith Athulathmudali and Commodore Jayasuriya. Any reporter with some experience would tell you that one thing that rarely fails with armed forces in the subcontinent is throwing rank at them. But my lie was more elaborate. I said I had to have lunch with Lalith the next day so I must be on that train to Colombo this evening. And that the JOC himself was supposed to ensure I presented myself before his minister in time. After some haggling, I was allowed to call the commodore, who, though confused, figured something was wrong and asked for me to be released. He also promised to leave word with Lalith’s office that I would keep my “date” for “lunch”. Sure enough, I was on that train to Colombo, and it turned out to be the last for many years. The next day, the LTTE blew up a bridge and it wasn’t rebuilt for a very long time. The next morning’s Colombo dailies had me on page one, at the very top. “Controversial Indian journalist so-and-so arrested while taking pictures of sensitive military installation in Trincomalee but let off with a warning in a gesture of goodwill”. Hardeep Puri was the first to call me with a mouthful — though only with kindly concern. I later learnt he too had found out about my arrest and had pulled strings to get me freed. It was different later that evening, as I was asked to present myself at Lalith’s home again. I really had no answer. So I let him vent. I reminded him, gently, that his government did. Enough, in fact, to print my story out in its propaganda pamphlets, to my great embarrassment. Lalith gave me another stern look, but a mock one, then both of us laughed, drank some more cognac and became friends, never mind that he was 20 years my senior. Postscript: Lalith’s wife Srimani took over his party after him but died of cancer in 2004, at just 58. In Colombo, I checked on his daughter Serela and was told she had moved overseas. Commodore Jayasuriya, who saved me much discomfort and probably my life, I was told, rose to number two in the Sri Lankan navy and now lives in London. I do walk around on my visits to Colombo to check out old haunts and spots, and remember the many friends and acquaintances I had lost violently in that vicious war — 21 out of merely my first, January 1984 notebook with 28 names. But more about the war and death in the next part tomorrow. Exdeptional post however , I was wondering if you could write a litte more on this topic?